= Ice Feather (Articuno summon item). = Thunder Feather (Zapdos summon item). = Fire Feather (Moltres summon item). = Cloned Sash (Mewtwo summon item). = Origin Sash (Mew summon item). = Thunder Fang (Raikou summon item). = Fire Fang (Entei summon item). = Ice Fang (Suicune summon item). = Silverwing (Lugia summon item). = Rainbowwing (Ho-oh summon item). = Forest Dew (Celebi summon item). = Slate of Rock (Regirock summon item). = Slate of Ice (Regice summon item). = Slate of Steel (Registeel summon item). 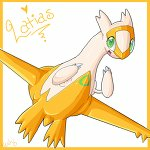 = Souldew (Latias & Latios summon item) *This will randomly choosen*. = Blue orb (Kyogre summon item). = Red orb (Groudon summon item). = Green orb (Rayquaza summon item). = Wishing star (Jirachi summon item). = Meteorite (Deoxy's summon item). = Orb of Knowledge (Uxie summon item). = Orb of Emotion (Mesprit summon item). = Orb of Willpower (Azelf summon item). = Adamant orb (Dialga summon item). = Lustrous orb (Palkia summon item). = Molten Stone (Heatran summon item). = Slate of Gigas (Regigigas summon item). = Griseous orb (Giratina summon item). = Lunar wing (Cresselia summon item). = Sea Crown (Manaphy summon item). = Nightmare Shroud (Darkrai summon item). = Gracidea Flower (Shaymin summon item). = Azure Flute (Arceus summon item). *This summon item will only obtainble at contests*.